We all have pictures of ourselves , mates , partners that just sum up the sport we do. 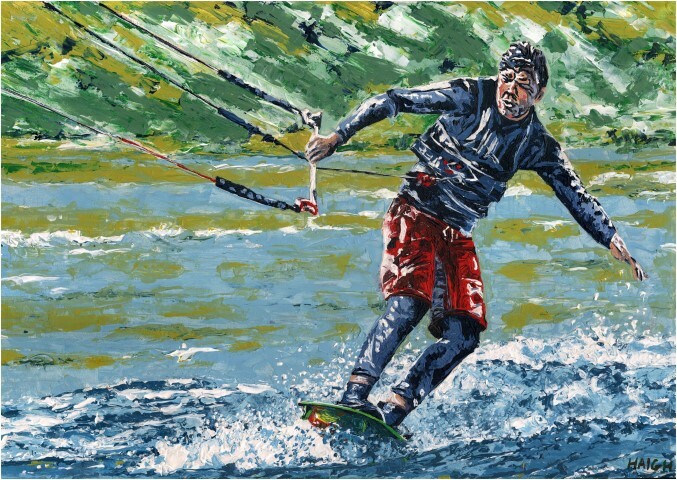 Kitesurfing, Surfing, Biking, Sailing, Running, whatever your passion. Why not turn them in to a bespoke artwork? I specialise in taking your photo and creating a one off artwork for you. Any size , acrylic on canvas artworks commissions. I make all my own canvas stretchers so, can work to whatever size you wish. Generally the bigger the better!! as epic days seem to work better on epic canvas. Working from your photo I sketch out the proportions of the finished piece on paper. Once you are happy with the the sizes I then sketch the painting full size lightly on the canvas. Working with acrylics and a pallet knife to give the work depth and texture I build up slowly the various elements. My work has an impressionistic element and the knife lends itself perfectly to this , allowing me to capture the feeling of the day, the speed, the life. Once complete and after drying I give the canvas an acrylic glaze to help protect it from dirt. for you to hang on the wall. I love my work and have done commissions of everything from cars, to landscapes and sports works. I can work from simple phone snaps, digital prints and old school printed photos, just get in touch and we can have a chat about your idea whether its for yourself or as a gift. 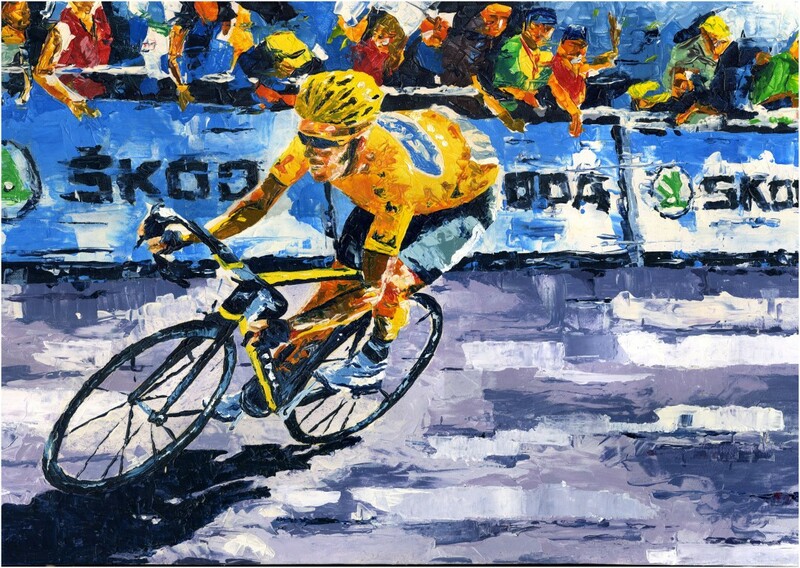 In 2015 we were lucky enough to host the start of the Tour de France here in the UK. 'Cragg Vale' is the UK's longest continuous road ascent and happens to be close to where I live. From a series of photos I took on the day I have tried to capture the speed, colour and spectacle of the day. Commissioned by a local Glossop cafe (brewwithaview.co.uk) I highly recommend you pop along for some of the best cake for miles and check out the paintings that remain for sale. Commissioned for a 40th Birthday present (sorry Andy.. I just gave your age away!). If you kite in North Wales you will most definitely have seen Andy & Karen out on the beach. Two good friends and out in all weathers! A large 120cm x 70cm canvas this is Andy making a hand plant look easy! If you kite in the UK you will probably know the name Carl the Bullet. One of the nicest blokes you will ever meet, a kitesurfer, a landboarder and a kite buggy nut. Always happy to give advice and help out you just have to check out his many many youtube videos. 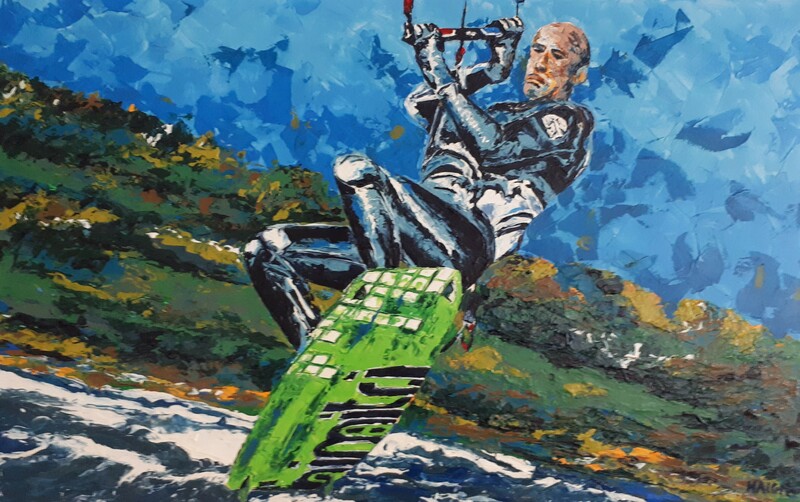 Measuring 120cm x 90cm this was from Carl doing one of his legendary big air board offs and formed part of a recent exhibition. A self portrait (well, you have to indulge yourself sometimes). 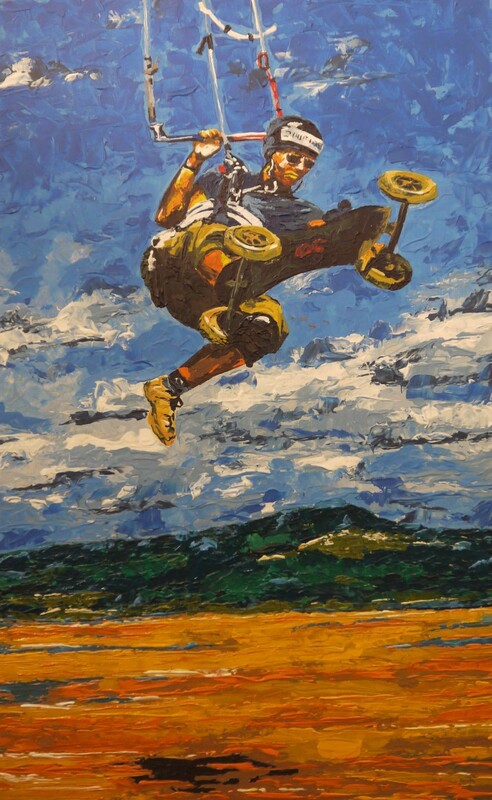 This painting is 90cm x 60cm and currently resides in my kitchen reminding me every day of one of the first days I learnt how to jump! 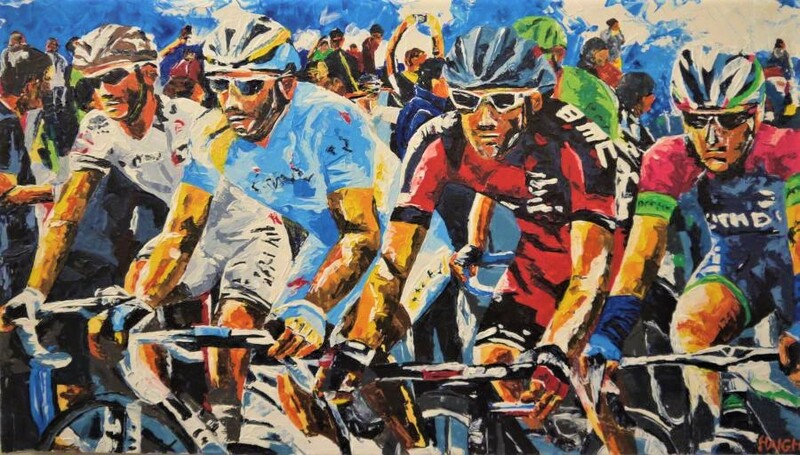 My other passion is cycling and on a trip across France and Spain a few years back I was lucky enough to spend a day watching the Tour de France. A fantastic day spent with one of my best buddies we saw the legendary Bradley Wiggins cross the line. 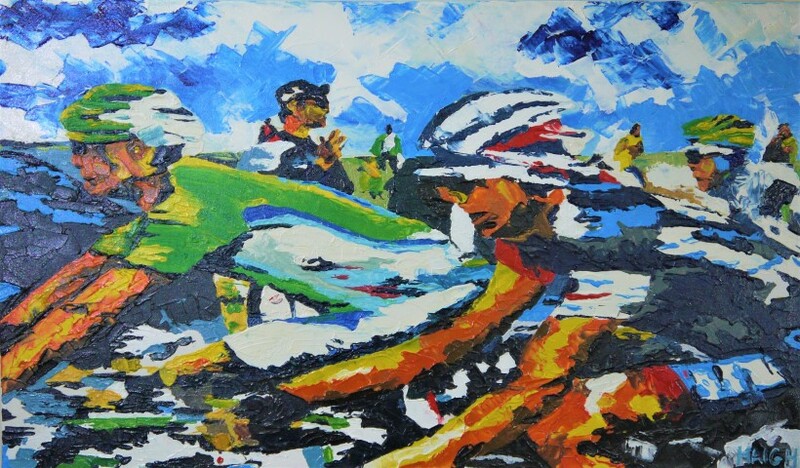 Measuring 110cm x 600cm this is one of my larger works. 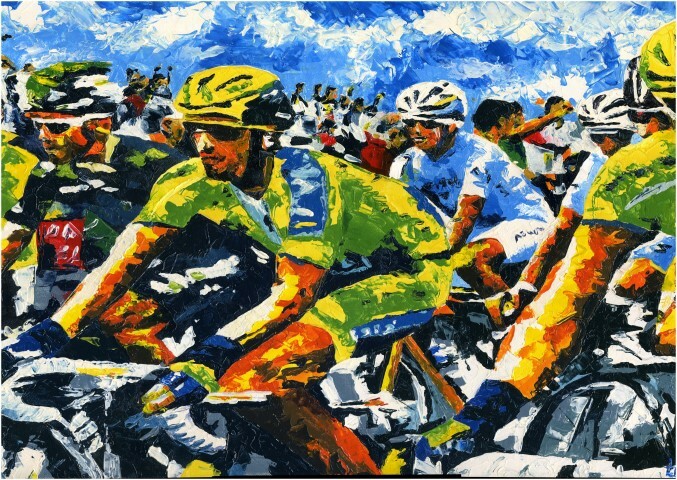 At a recent exhibition I sold this work to a fellow cycling nut! 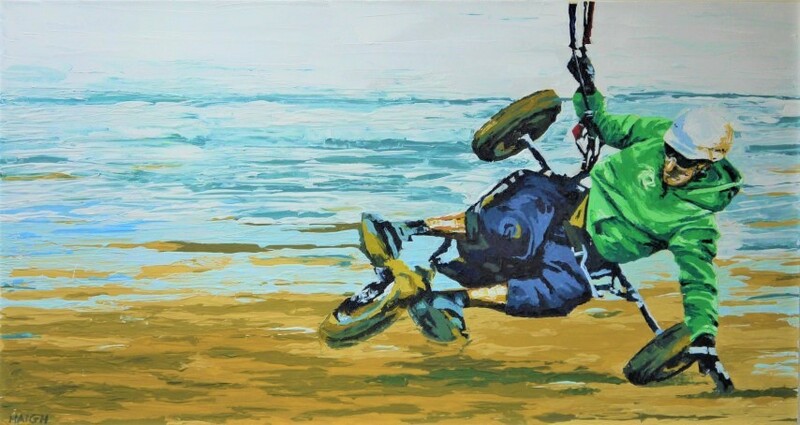 My own personal passion along with cycling is kitesurfing. by my good friend Chris. and Chris was concentrating ... very hard! The Coffee Shop Wimberley Hill.